December first, are you kidding me? It's that time of year to sip champagne out of sugar rimmed glasses at fabulous holiday Christmas parties! And nothing says holidays like a little sparkle, am I right? That's why I just had to have this skirt the instant I saw it. It screams Christmas! Have y'all ever heard of SheIn formerly known as SheInside? If you haven't you are going to thank me. 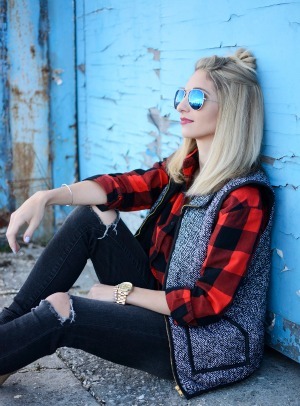 Their website is stocked full of trendy clothing at an incredible price point. I can't get over the prices! My skirt is less than $16! And my blouse is less than $15. I don't know about you, but I can handle those prices! Everything else I'm wearing is extremely old, but I've linked similar items above and on the widget below for you. These heels are soooooo old from JustFab online, but I found a few similar options like these (um yes $15 price point!) and these are also fabulous for holiday parties! And oh my goodness, these would make such a statement and catch the light! I also found this similar bag that I have put in my shopping cart, but I'm currently just staring at it dreaming of it's gorgeous sequins and asymmetrical goodness. I probably won't pull the trigger, but a girl can dream right? Do you get excited about holiday parties? Or do you tend to make excuses not to attend? I always go and I'm so happy I did, but I am the girl that instantly takes off her bra, let's down her hair and throws on sweats when I walk in the door! 15 comments on "Holiday Sparkle"
Do you have a tutorial for your braid? It's seriously SO gorgeous girl!! Your braids are amazing, and that skirt is gorgeous (can't beat that price!). 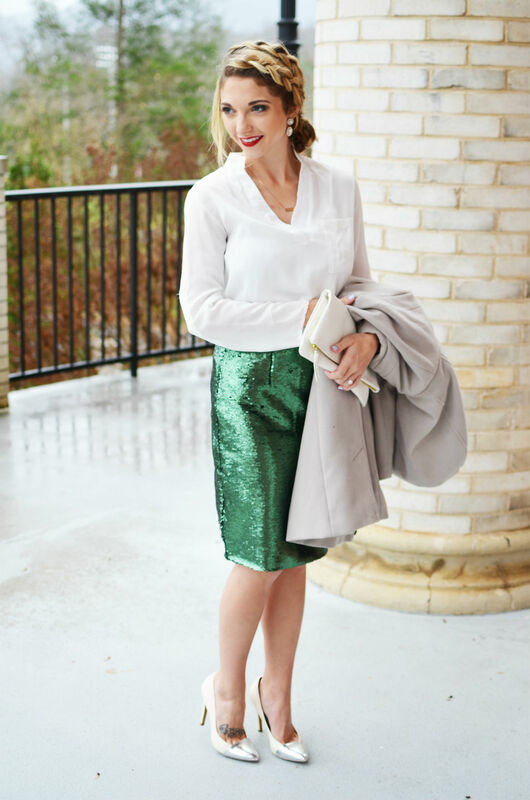 I also love seeing some green sparkle for the holidays since red is usually more prevalent. 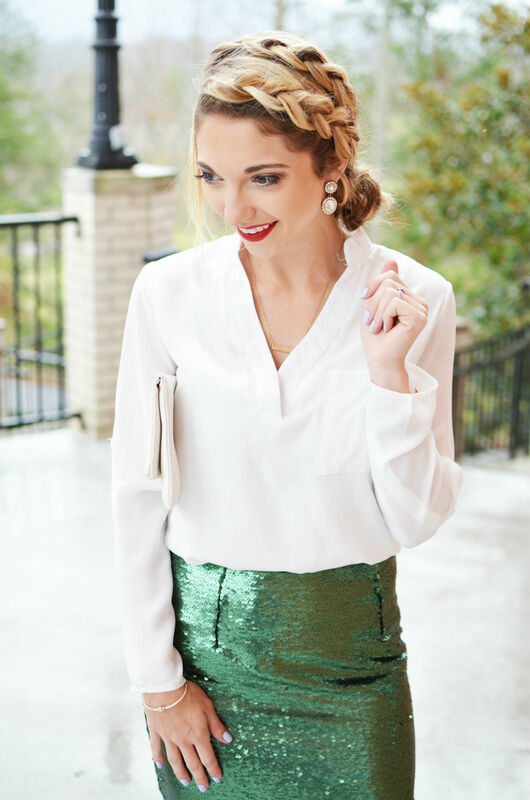 Such a perfect holiday look! 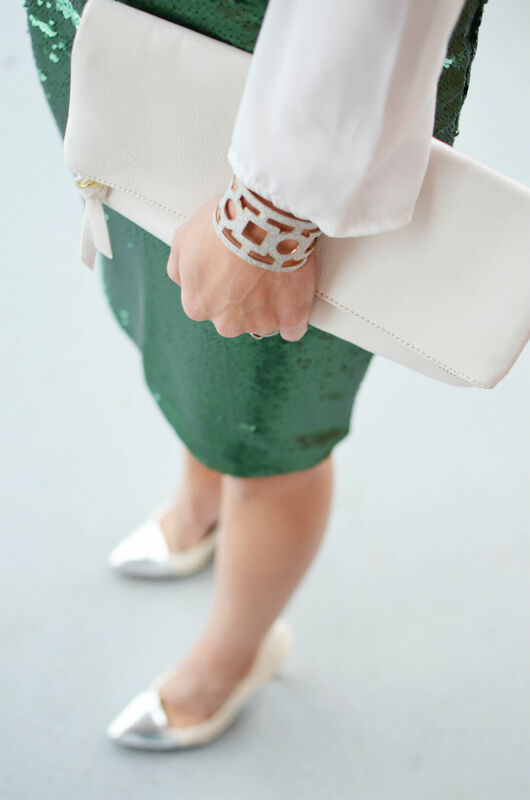 You can never go wrong with sparkles! So perfect for the holidays! People often overlook the green at Christmas and only focus on the red - this is such a great alternative! Your hair...that skirt!! 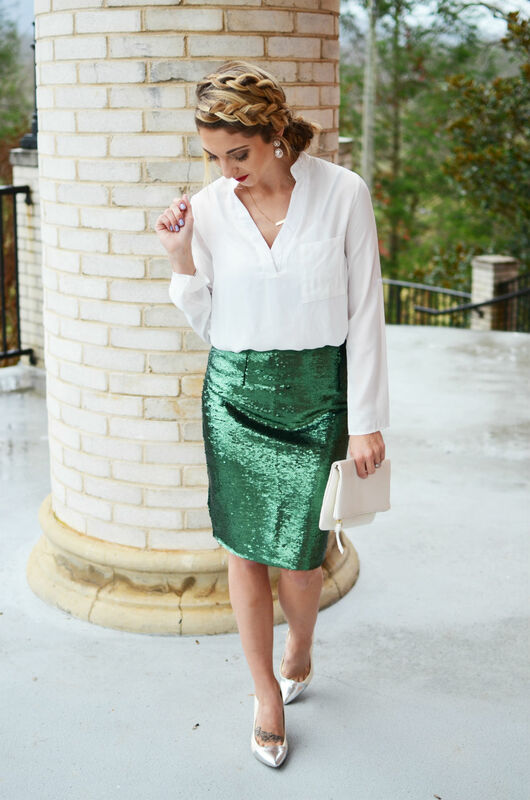 You look absolutely gorgeous girlfriend- going to check out all things sparkly right now! YOU ARE SO GORGEOUS AND PUT TOGETHER. I TOTALLY LOVE IT. AND THE BUDGET IS AMAZING. THANK YOU THANK YOU THANK YOU. CAPS LOCK LIFE for this post because you are A STUNNER and always are!! Gorgeous!!! I love holiday party fashion, but have none to attend this year. Newborn life! Gorgeous, girlfriend! You look so fab! Yes please do a tutorial for your hair! I don't even know where to start with this outfit. I love it from top to bottom (including your hair!!) 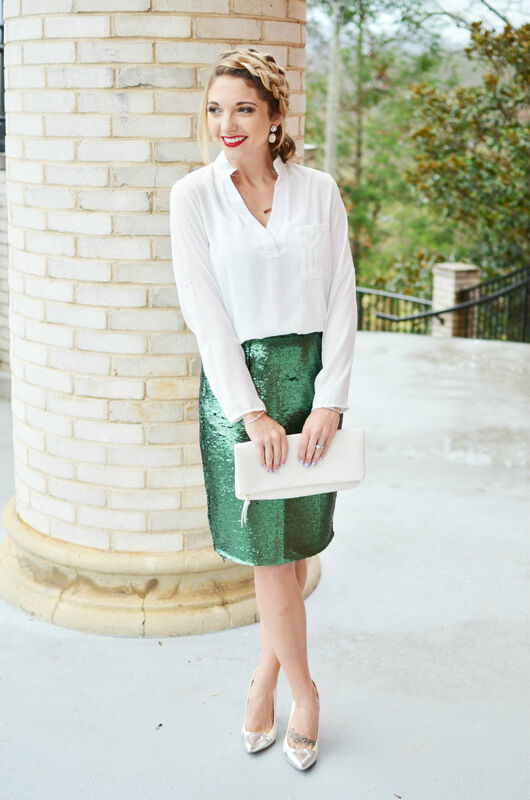 I love that the skirt makes it a fun and festive look, but then you tone down the rest of with with a neutral top. It's seriously making me wish I had a fancy Holiday party to go to this year!